1. Sitting in the cath lab waiting room, after getting the details of the procedure from Mark's doctor, my father and I wait to be escorted to where Mark will be staying for the night. 2. As soon as he sees me, Mark reaches for my Starbucks cup because he's so thirsty. And hungry. The nurse starts pushing his bed toward the elevators and I hurry to keep up asking, "Hey, where you going with my coffee?" 3. Up on the third floor I am pleased to find that Mark gets a private room. 336. I watch as he moves from the OR bed to the room bed, wanting to help somehow, but there are already two nurses right there. 4. The nurses adjust the bed, fluff the pillows and give Mark an ice pack for the incision site. I'm leaning on the wall at the foot of his bed and when I step away, I cause a plastic body board that was also leaning on the wall to fall over. Oops. 5. Over at the large window I place my purse and Kindle on the sill and listen as the nurses buzz around doing their duties, admitting Mark to the floor. One tells him to do something and he flat out says no. I may or may not have scolded him a little to not give them a hard time. 6. A round, grey-haired nurse enters to do the intake. Or as it's more aptly described, ask you every question under the sun making you feel like you're selling your soul. Do you drink, smoke, do recreational drugs (isn't drinking and smoking recreational too? ), have regular bowel movements or ever exceed the speed limit? How many surgeries have you had? Um, how much time do you have? 7. Mark is starving...TO DEATH. He really wants to call an order in for food but this woman keeps asking him questions. Finally she realizes this and tells him to go ahead, that she can ask me instead. Oh yippee! Mark scratches his head for a few more minutes trying to figure out what someone who's on a diabetic and heart healthy diet will be allowed to eat. Turns out, a French dip sandwich and fries without salt is alright. Go figure. 8. The nurses finish their tasks and food arrives promptly. I am relieved Mark is getting to eat because his blood sugar was only 74 and we already dealt with a low that day. As he eats, I flip through a brochure about the device that now resides in Mark's chest. Looking at the illustrations I can see why the shape of a love heart is what it is; real hearts do somewhat look like one. In an abstract sort of way. 9. I check the time. It's nearly 5:45, going on 6:00. Thinking about the kids, and my dad's yawning next to me, we should leave soon. But I hesitate. It's gotten easier over the years, but I will never like leaving my husband at the hospital by himself, while I get to return to the comfort of our home. It's hard in a different way now, though. Now I am traumatized by terrifying middle-of-the-night phone calls that something scary is happening to Mark. Submitting this to the Yeah Write #56 Challenge Grid. I'm so sorry you have to deal with all that. It must be seriously stressful. Thank you for linking up an hour from your day. I have tears. Beautiful post and tribute. I'm sorry things are so rough for you and your family. My prayers are with you for a brighter future. Big hugs Jennifer! Not to get off the subject but I love your new header!!! I'm so sorry this is your life,and I know it really is your life. Strange to say it, but you're good at it. Not everyone could hang in there. Hats off to you sweetness. You know, I kind of love this comment. Thanks, Kim! It's hard to shake off the scary thoughts and worries. I feel for you. I would be the same. 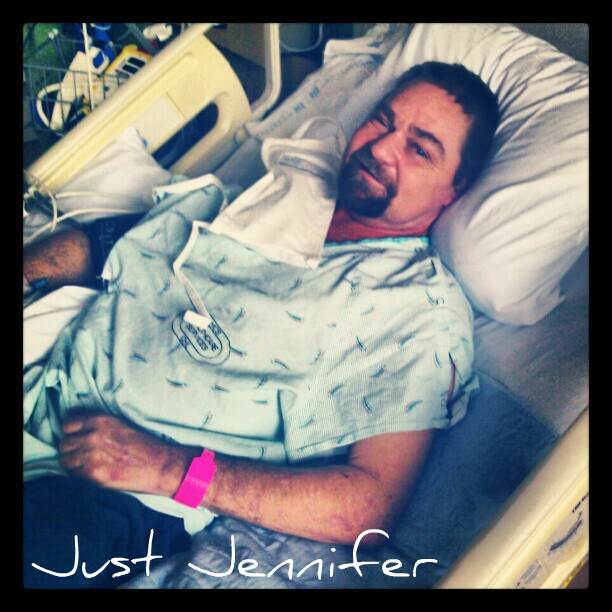 My prayers are with you and your hubs Jennifer! I'm so sorry you are having to go through this, both of you. Sending lots of love your way as you continue to go through the healing process. You sound very brave and very strong..and like a very good wife. And I agree with Kim. You're header is great! Here's to a brighter week ahead. Thanks so much...for all of it! so, so happy for you and Mark that all is well. the worst feeling I've ever had was when I was the one in the hospital - pregnant and trying to stay that way - and hubby and my 2 kids had to leave at the end of visiting hours. worst feeling ever. Coming home is the best feeling ever - and let's pray that is soon for Mark! Ugh. It's such a yucky feeling. But he only had to spend the one night. Wow, Jennifer. I'm always amazed by the amount of strength you show and share here. I wish and pray for Mark to have a short and quick stay and return to healthier days and for you, lots of hugs! Thankfully he only had to spend one night. I think his healing is going well so far! My heart hurts, for what was, what is and what will be.... and it hurts for you and Mark :O) Yeah...I was a little selfish in that moment it took to type the first comment. I'm pretty sure no one really understands what races through your head and heart each time to you walk in and out of the hospital room door until you're the one wearing the shoes and taking the strides. Your strength and grace are beyond commendable. They are of super hero proportions! Your comments are so thoughtful and nice, thank you. @DiaperDads says my superhero power is YARNBOMBS! Even though it's terrible that you have to leave him there again I am glad that it seems to be less scary than last time. And you do handle it so well, way to go! Also, the new blog design? LOVE! It was way less scary! And I'm so glad you all are liking the new look! Those rooms are pretty small, so knocking things over is easy to do. So glad to hear that the surgery went well. I hope his recovery goes smoothly. I can imagine, especially with everything you've been through, why you wouldn't want to leave him at the hospital alone. It's a good thing I've let go of my control freak side! First, love the new look of your blog; it's elegant and cool. Second, I'm sorry this is happening to y'all but it's a great post in that you really capture a slice of life in the hospital, from the emotions to the mundane details. Best wishes for an easy recovery! I love that you see all that! That sounds very scary. I hope you are able to take care of yourself as well as him! I love your new look. Suits your heartbreaking story. I know you like to think of yourself as an ordinary person just doing what comes naturally to take care of a husband you love. But, I would beg to differ. Not everyone is capable of putting one foot in front of the other like you do. Especially with your spirited attitude. If I ever need to find the strength to handle what you've got on your plate I will try my best to emulate you and maintain that awesome outlook! So cool that you GET the new design. Thank you for your awesome comments! Thanks for caring about how he's doing! Late night telephone calls are always scary when a loved one is in the hospital. you guys have been through way too much lately!! Can't imagine how a french dip and fries is considered eating healthy, but that's a diet I'd like to be on! Yup. I spent the night on the couch. I have a blind brother in law from it. My coworker got the throw p flu and had to be admitted. Diabetes is stupid! I have a blind friend as well. How awful to deal with...you sound like a champ though. Both of you! You both are so strong. I am always amazed by the strength people show when going through medical crisis and situations. I've shared with you about my dad and watching him and my mom navigate the world of chronic illness has been eye opening, to say the least. You're amazing! Yes, I do remember you telling me about your dad. I second the comment about the new blog design. I really like it! The strength you and your husband have really shows in your writing. I'm glad you are able to share it on your blog. Me too - on both comments! It must make your heart hurt. Your love for your husband shines through your words! Hope he's home soon. LOVE the new header. Walking out of hospital rooms is awful. I can't imagine doing it with my husband there. My heart goes out to you. Sending good thoughts your wa. It is just plain awful. But yet, doable, when one has to. I'm sorry your husband has to go through all of this. This was a beautifully written post. I'm sorry I don't know this, Jennifer, but what is your husband in the hospital for. It sounded like this is something he has to go through often? This is so much more than a list! It's very loving. Your husband is blessed to have you! This time, he had a defibrillator implanted. Thank you for saying this is loving. I like that. My husband had a defibrillator planted a couple of years ago after a heart attack at 43. Scary stuff...I've been there, Sister! Great list! My husband is currently 43. He's also had 2 (known) heart attacks. That sounds really tough. I'm sorry you are both having to go through that. Leaving loved ones in the hospital is terrifying. There's always that worry that something will happen when you're gone. I hope the best for you guys. I think the listicles worked really well for this. I liked reading it in a very orderly way. It's almost clinical - with the emotion contained in short bursts. Thank you for sharing!